The GPS double difference carrier phase measurements are ambiguous by an unknown integer number of cycles. 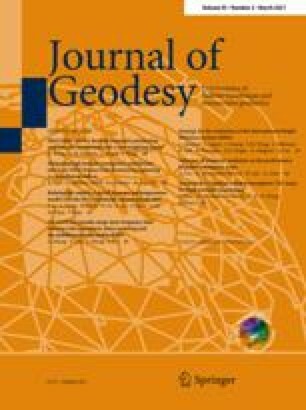 High precision relative GPS positioning based on short observational timespan data, is possible, when reliable estimates of the integer double difference ambiguities can be determined in an efficient manner. In this contribution a new method is introduced that enables very fast integer least-squares estimation of the ambiguities. The method makes use of an ambiguity transformation that allows one to reformulate the original ambiguity estimation problem as a new problem that is much easier to solve. The transformation aims at decorrelating the least-squares ambiguities and is based on an integer approximation of the conditional least-squares transformation. This least-squares ambiguity decorrelation approach, flattens the typical discontinuity in the GPS-spectrum of ambiguity conditional variances and returns new ambiguities that show a dramatic improvement in correlation and precision. As a result, the search for the transformed integer least-squares ambiguities can be performed in a highly efficient manner.